I would say a muffin mix is an extreme hit when your kids are requesting you make it for the third time in two weeks. When you make an excuse to stop at the grocery store so you can pick up another box, you know you love it just as much! I had noticed King Arthur Gluten Free products popping up in the regular aisles of my grocery store, but was, of course, reluctant to throw away another $5.49 on an unknown product. 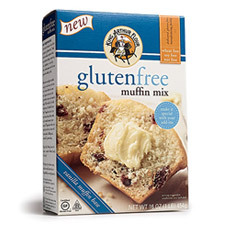 I figured I have made decent gluten free muffins before with flour mixes at home, so if I really wanted muffins I should just use the products I already have. Sensible and thrifty, that’s me. Please don’t ask if I ever made those muffins. Needless to say, I was very pleasantly surprised when I received this muffin mix of interest as part of a VERY belated birthday gift from my aunt (“Mom, you should really check the date on those!”) Well the date was fine and the muffins were INCREDIBLE!! Mix #1 was prepared according to the directions on the box. It yielded a vanilla muffin base to which you add 1½ cups of add-ins of your choice. We had on hand a lone banana, mini chocolate chips, and cocoa powder (who doesn’t love a double chocolate muffin?). We filled 18 traditional muffin cups, baked them for 20 minutes and then enjoyed pure muffin bliss! They were amazing. The absolute best gluten free baked item I have ever made. The taste, texture and consistency were those of gluten filled muffins that are now just a distant memory. The box claimed the muffins would stay fresh for 3 days if stored airtight. If you’ve ever baked gluten free you know to ensure freshness, the freezer is your best friend. So I was determined to test this theory, but had to hide a muffin to make sure there was one left on day three. Well let me tell you, it was TRUE! Day three was just as heavenly as day one. Please don’t judge my excitement over muffins, but when you are used to eating baked goods that taste like a dried out sponge, something of this caliber has you thanking the gluten free gods! So now we fast forward to day 4 when my kids realized the muffins were all gone. Back to the store for muffin mix #2, I go! This time I wanted to experiment with reducing the fat. The directions call for 6 tablespoons melted butter or oil. I replaced 3 tablespoons oil with 3 tablespoons low-fat vanilla yogurt. While mixing the batter I noticed it definitely had a different texture. It was more airy and gooey, much like a box cake mix. We used the same add-ins for consistency sake (don’t let me fool you; it was all I had in the cupboards). The muffins baked beautifully. They were even fluffier with a slight crust on top, very similar to a cupcake. Batch #2 was consumed just as quickly as the first. I would absolutely use this version in place of a gluten free cake mix, since I have yet to find one that I love. Fast forward yet a few more days and I found myself saying, “Sure I’ll get another mix, since I should really try a batch using applesauce as a replacement before I write the review!” So 3 tablespoons of applesauce in place of 3 tablespoons oil it was. The consistency was nearly identical to the first batch. When paired with cinnamon chips and diced apple as add-ins, the results were scrumptious! The packaging states that this product is made in a dedicated gluten free, allergen free manufacturing facility. It is free of the eight most common food allergens including wheat, soy, and nut. Enjoy! King Arthur Flour gluten free muffin mix gets 5 SPOONS for sure! Go out and pick up a box…or three! No one mentioned blueberries. I have some wild berries in my freezer. Should I defrost them first? I’m fortunate in that I don’t have any gluten issues. However, I have noticed that there are a lot of gluten-free products appearing on the grocery shelves. At one store, they even have gluten-free loaves of sliced bread that are only a little bit more expensive than the regular bread. Thank God that people are getting the message that gluten is indeed major dietary issue on par with nut allergies. Thanks so much for this, Michelle. I have bought the pancake mix and loved it SOOO much (in fact, we make GF, egg free, dairy free cakes that THAT ROCK with it). I was wondering if you have, or anyone else has, tried making the muffins without the eggs (I’m allergic). Thanks for bringing my attention to the muffin mix. I’m not a very good “from scratch” person. Love mixes! I look forward to trying it. So glad you enjoyed the muffin mix, Michelle! I’d highly recommend our gluten-free brownie mix – SUPER delicious, even to a dedicated gluten eater like me! Thanks, Michelle! Now I know what to look for!